Chapala Mayor Joaquin Huerta and his staff have started exploring new options for investment in public works projects after the National Water Commission (Conagua) nixed plans for a major overhaul of the Malecón (boardwalk) commercial complex that had been envisioned as the municipal administration’s signature achievement. This week the city celebrated the inauguration of the outdoor events forum that was designed as the centerpiece of the renewal project. But Huerta has been forced to put the rest of the blueprint on the back burner since Conagua issued a notification denying its approval to rebuild the sales modules occupied by more than 300 local vendors. According to the mayor, the agency’s rationale for refusing consent is that the area of intervention is situated within Lake Chapala’s natural boundaries where the construction of permanent structures is prohibited. The ruling appears to fly in the face of reality. Built up over decades, the entire eastern leg of the Malecón sits well above today’s waterline. The last time water spilled over that section was in the mid-1970’s when Lake Chapala filled to maximum capacity. The bad news comes on the heels of a recent Supreme Court decision validating a Conagua order for partial demolition of the Malecón in San Antonio Tlayacapan. The eastern section was built by the previous administration without proper authorization and adherence to guidelines established by federal agencies. Although Conagua has not yet pushed for execution of the order, Huerta is being cautious to avoid repeating the errors of his predecessor by backing off on the Chapala Malecón project. While maintaining dialogue with top Conagua officials in Guadalajara, he acknowledges that the probability of getting their okay to proceed with the renovation plan is practically nil. With all that in mind, city officials have gone back to the drawing board to come up with alternatives that fit in with programs that are eligible for the 25-million-peso funding package previously earmarked for Chapala by the state legislature. They have to come up with well-developed proposals that fit in with spending package specifications defined by state and federal agencies. And they are under the gun to get things rolling before Huerta’s term of office ends in less than 15 months. A proposed “Plan B” calls for reassigning the bulk of the expenditure to rehabilitate Avenida Cristiana-González Gallo. The concept is to develop a tourist-friendly traffic loop wrapped around the city center. The broad thoroughfare runs roughly parallel to Avenida Madero, linking the east ends of Pepe Guizar and Ramón Corona. Its principal landmarks are the González Gallo Cultural Center, Chapala’s former railway station and the Cristiania park. In addition, the city council has approved a negotiation with the state government to reallocate three million pesos in the Regional Development Fund (Fondareg). The purse was originally set aside to relocate the waterfront skateboard park on the grounds of Cristiania Park once it was torn down to open space for the new commercial complex. 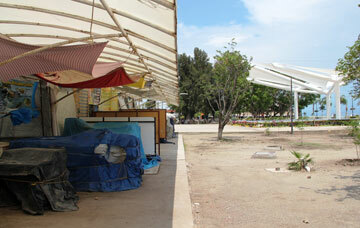 If the state concedes to a switch, the money will be applied to refurbishing the Chapala plaza. Under the design presented by the city’s urban planning office, the north side of the square would be razed and turned into an open esplanade for holding civic events, bordered on the outside by trees and planters. The central bandstand kiosk and south side of the square would be left intact. Spending schemes for Fondareg projects generally require municipal governments to chip in 50 percent of the costs with the state picking up the other half of the tab. Municipalities are sometimes allowed to cover part their share by tapping on their employee rolls to provide the manpower. Meanwhile, Chapala has also sought funding from Jalisco’s Tourism Ministry to complete the restoration of the former Presidencia Municipal, a project that has been underway intermittently since the old city hall building was condemned for structural damages in 1998. The faults were repaired and fully reinforced several years ago. Restoration of the south wing that houses Chapala’s historical archives is currently in progress. The Huerta government is keen to obtain sufficient resources to finally finish the job.